Welcome to the first stunning Dwel @ The Hepburn abode. Ingeniously designed, The Hepburn does not have a single `square` room. Instead, you will find curving walls and rounded floor-to-ceiling windows. A playful combination of dark and light cabinets, mixed with sleek Bosch and Blomberg appliances, create a modern European aesthetic in the kitchen. Kitted with everything needed to whip up a feast, or slice into a pizza, Dwel has given much thought to what goes into a functional and enjoyable kitchen. Dwel residences are supplied with Mrs. Meyers soap products. We know you care about the environment, and so do we. The spacious layout means there are never too many chefs in this kitchen. The five burner gas stove is a culinary dream, worthy of every gourmet recipe you`ve been meaning to try. Pull up a mod leather bar stool whilst savoring a glass of wine or breakfast for two. Flow easily from the kitchen to the living space. Above the custom leather sofa hangs a custom piece by Martin J. Cervantez. To offset the sweeping, rounded lines of The Hepburn, this Dwel luxury apartment features hard lines in the midcentury modern furniture. The geometrical play continues with the carefully considered accent pieces. A heavenly nook for reading the morning paper or enjoying the view over the inner courtyard. Work doesn`t feel so onerous at this nimble, functional desk. Beautiful art and an inspirational quote will keep you going `Subtle Infernos` by Martin J. Cervantez hangs above the king-sized bed. Scandinavian style night stands contrast beautifully with the deco lamps/ A TV and well-placed mirror complete the bedroom. 9` floor-to-ceiling windows frame a truly stunning living space. Find touches of quality in every corner. The large walk in closet. A must-see in DC. We love the clean lines of the sleek bathroom. Dwel provides luxury toiletries from William Roam, which are crafted and created here in the US. The backlit vanity mirror and custom medicine cabinets are just a couple of the ways The Hepburn has created streamlined, luxury residences that don`t feel fussy. The impeccable bathroom is another study in contrast between light and dark, high and low, like the vanity The deep soaking bathtub surrounded by these neutral tiles is incredibly peaceful. Dwel's 'standard' of functional yet luxuriously tailored apartments were designed in concert with the property to ensure an unrivaled guest experience and a level of service that is uniquely personal. The two masterpieces by locally renowned artist and veteran, Martin J. Cervantez, featured prominently in this airy 1 bedroom apartment, were the inspiration behind the design process, a study in modernity and geometry. 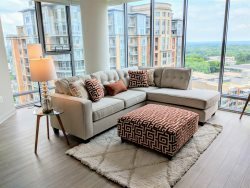 From the structural, mid-century furniture to the luxury finishes to the whimsical objets d'art to the pops of color, this apartment will leave you speechless.